As the Sky Sports announcers said themselves, this season of Formula One has often been a game of who can finish third behind the Mercedes cars. 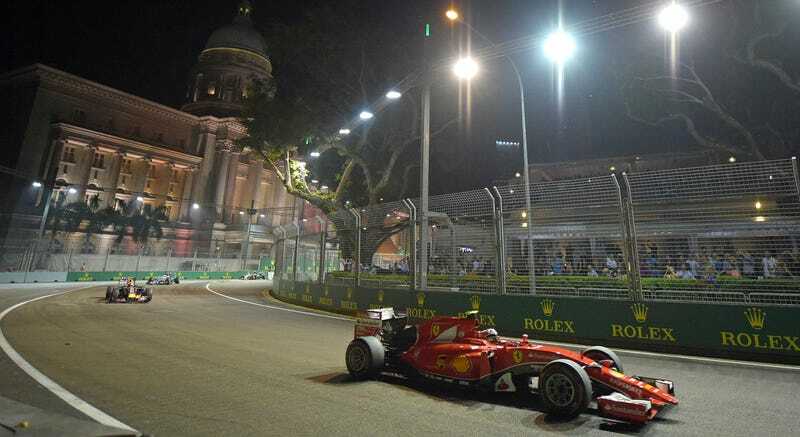 Not so in Singapore this evening, where a chaotic race gave Ferrari their first double podium of the season and plenty of memorable moments. Vettel’s Ferrari teammate Kimi Raikkonen finished third, while Red Bull’s rising star Daniel Ricciardo finished second. Mercedes’ Nico Rosberg had to settle for a fourth-place finish. As for his teammate Lewis Hamilton, well, he had probably the most disappointing race he’s had in years. After suffering with car trouble all weekend, including qualifying, he was forced to retire from the race following a power loss that dropped him down to ninth place by lap 28. This is a big deal because it means Hamilton finished with no points, putting Rosberg 41 points away from him and Vettel almost 50. Hamilton’s still in the lead, but the championship points gap just closed a bit. He probably can’t afford another race like this one. Hamilton wasn’t the only one with some headaches. Fernando Alonso, Jensen Button, Felipe Massa, Nico Hulkenberg AND Romain Grosjean all ended up not finishing the race. Massa and Hulkenberg collided, leading to a three-pace grid penalty at the next race in Japan for the latter as it was his fault. As the BBC notes, part of Button’s wing nearly struck Carlos Sainz’s helmet, a very scary moment indeed in light of recent events in the open-wheel world. As for our boy Alexander Rossi, he finished 13th on his official F1 debut! Not... great, but he finished, and that’s more than you can say for a lot of the drivers this weekend. Wooo! God Bless America! All in all, an interesting, thrilling, even scary race at times, but a memorable one. What was your favorite moment?